I just realized that it's been awhile since we've actually posted some free music so I intend to to rectify that mistake over the next couple of days with a string of free music posts. It's also been awhile since we announced the rumors that Slaughterhouse would be signing to Eminem's Shady Records, a little over 2 years to be exact. Now the wait for the Shady/Aftermath follow-up to their self-titled debut is finally over, "Welcome to Our House" will be released this Tuesday August the 28th! 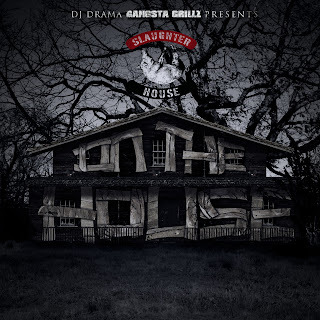 If that's too long to wait (which it is) Royce, Crooked I, Joe Budden & Joell Ortiz has hooked up with DJ Drama to release a free mixtape on his Gangsta Grillz series appropriately called "On the House." If that's STILL not enough to tide you over until Tuesday (which it probably isn't) and you live in or near Chicago then local fashion boutique Jugrnaut has got you covered! They've teamed up with Shady Records for an early listening party for the album that will be at their store on Saturday 8/25/12 from 6-8pm. 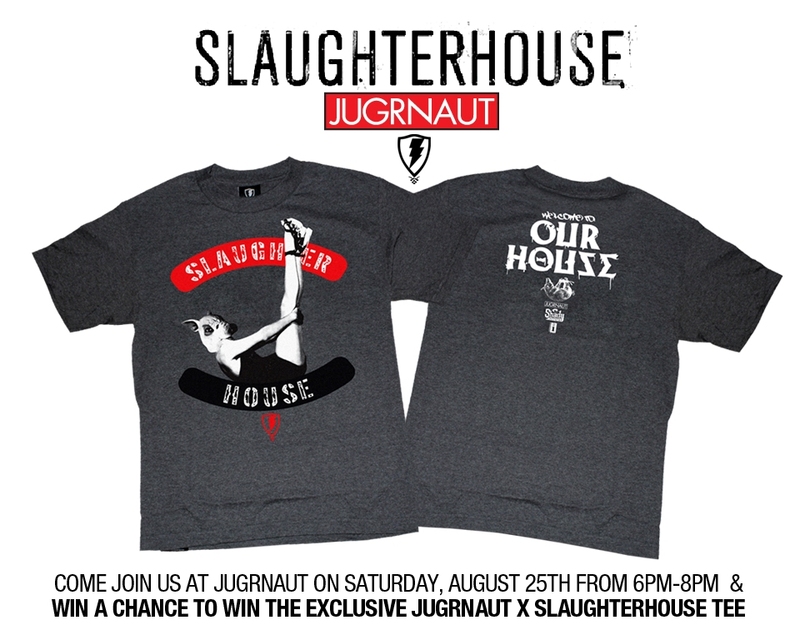 To top it off they will also be releasing an EXCLUSIVE Slaughterhouse shirt that will only be available as a prize. To win the shirt (pictured below) you just have to Tweet, Instagram or Twitpic about the in-store Listening event coming this Saturday & let people know that the Slaugherhouse album “Welcome to our House” is in-stores on Tuesday, August 28th. You will have to use the hashtag #SLAUGHTERNAUT in order for them to keep track of your posts. The most active and illest instagrams or tweets etc wins a Shirt! Remember to include the hastag with every post and you must be present at the Listening party to win. You can get more details at the link below as well as download the free mixtape from Datpiff.com. You can also click the jump to watch behind the scenes footage of Slaughterhouse recording their epic 15 minute track "Truth Or Truth" which is featured on the On the House mixtape.